Mobile operators from around the world have come together to support the 1GOAL: Education for All campaign by giving over 1 billion subscribers the opportunity to join the campaign. 1GOAL is bringing together footballers, fans, charities, corporations and individuals to achieve the ambitious aim of education for everyone. 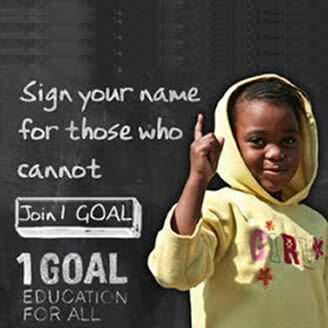 The 1GOAL: Education for all campaign is the legacy project of the 2010 World Cup supported by the football world and FIFA. It aims to mobilise support to hold world leader to the promises that they made as part of the UN Millennium Development Goals of 2000. The campaign involves people signing up to a petition that will be presented to world leaders at an education summit later this year urging them to provide further funding for education. The mobile campaign is being coordinated by the GSMA, with the support of mobile operators including Telefonica Group, AT&T Wireless, Bharti-Airtel, SK Telecom, Zain Group and many more, will send a free MT SMS that will inform consumer of the campaign. They will then be able to express their support by responding “YES” to the SMS, visiting the mobile site (1goal.mobi) or via e-mail. The mobile element of the campaign will also involve a mobile app for Nokia and Samsung devices; soccer related downloads such as player images, videos, ringtones and wallpapers.